Forward and reverse are controlled by the Johnson bar, shown here. which, you guessed it, reverses DC polarity to the drive motor, just like we've always done it. 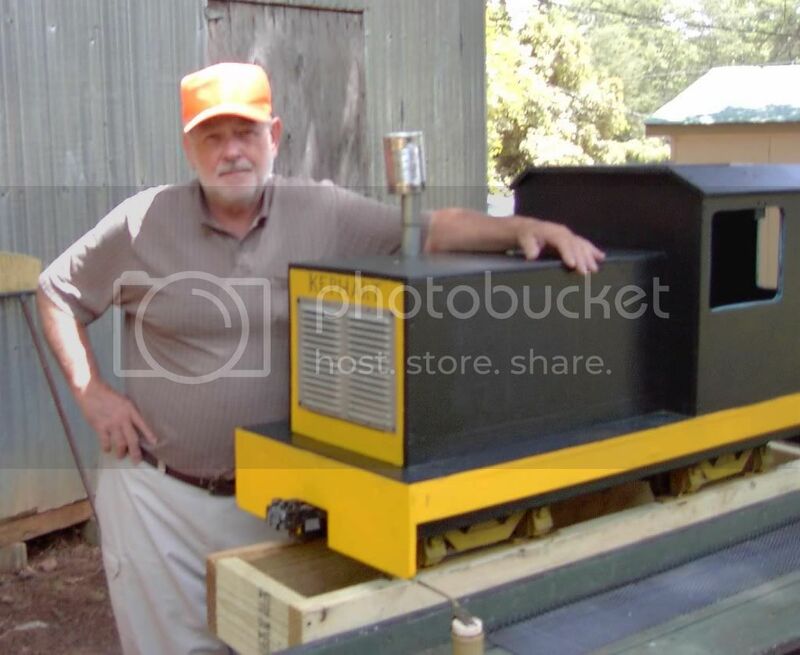 Modeling the EXPERIENCE of 2ft narrow gauge by REPLICATING the equipment. No. 11, while running on the same 7 1/2 inch gauge track, is HUGE when compared to regular 7 1/2 standard gauge. I think the 'Bountyland' take on 7 1/2" narrow gauge, is the one that does it for me ! Small trains ... but BIG ! size ... or something like that ! The freight shed is now about complete. About complete but not quite. I still have to add the batten strips to the rear. The new Bountyland freight shed building is lookin' GREAT ! I do like the look of your 'hand laid' track Bob. That Code-1000 you use is VERY realistic ! I guess the lil' plastic-bag with 500 spikes in it, probably needs a fork-lift to move it. Flextrack is OK, but you probably can't order it from 'Walthers' in your scale ! ... I hope mine has that C L funky narrow gauge look like yours Unk ! I guess asking what you stain your ties with ... & if you pre-distress them, is just silly ! Keep it BIG ! Uncle Bob !
" I guess asking what you stain your ties with ... & if you pre-distress them, is just silly ! " Si, with BLRY, "weathering" is a problem, not a technique. We are currently replacing the wood in our 50 foot bridge from the bents up, and next year will see the start of replacing every fifth tie. BTW, our "spikes" are one inch washer head screws. I have always been a fan of the model railroad power-packs with the extra BIG ! throttle controls. Those fiddly little ones have always given me thumb-ache. As usual though, I see that Bountyland does it ^^ BIG ! ... they don't need to be Thomas Edison to work out how to wire it all up ! I couldn't resist re-Posting this GREAT image of Unk with his loco 'Kephart' ! ... right from the very beginning ( more or less ) I believe. ... you won't be beating him on SIZE anytime soon though !! Bob ... You'll ALWAYS be THE BIGGEST ! Somehow I missed Part II Thread getting started... Looking great my friend. You provide inspiration for my backyard railroad, love the look and theme.